The official Twitter app for Android offers a reliable, no-frills way to manage a single account, but lacks polish. Navigation is intuitive and finger-friendly. The top navigation bar, which is ever-present in the app, has a button to compose a tweet (with or without your GPS location info) and a button for search. The Home screen has eight buttons labeled Tweets, Lists, Mentions, Retweets, Messages, My Profile, Trends, and Search. The Menu button slides up options for settings and signing out. In Settings you can choose to sync your Twitter contacts (and their profile photos) with your phone's Contacts. This is probably the most unusual feature of this app; I haven't seen it in other Twitter clients. You can configure notifications and the interval to check for new tweets, choose between the bit.ly and tinyurl link-shortening services, and choose between yfrog and Twitpic photo hosts. The Tweets button shows you the newsfeed from all the people you follow on Twitter. Click on an individual tweet to bring up options to reply, retweet, make it a favorite, or share it (via e-mail, say). Pressing Menu in the Tweets window gives you the option to view the tweets on a map (this feature works only for tweets of users who have enabled the Tweet Location feature). The Lists button lets you peruse the Lists that you have created or subscribed to. You can also create new Lists here. If you aren't familiar with Lists, think of them as a way to organize and group the people you follow. It helps make sense of the chaos that can occur when you follow too many people. The Mentions button shows you all the tweets that mention your username. Retweets shows you which of your tweets were retweeted by other people. Messages shows you your Direct Messages, and My Profile takes you to your Profile where you can edit your personal info and view your followers, the people you follow, and your Lists. Clicking on another user's profile photo takes you to their profile, where you can Follow, Mention, Block, mark as Spam, or add them to a List. Trends shows you the current trending topics and hash tags on Twitter. Some people find such information useful, but I find that spammers tend to destroy the relevance of it very quickly. The Search feature is unremarkable. It has an option to enable location-based search, but in my area that reduced the results of many queries to zero. You can search for Twitter users or search through tweets for keywords. Your most recent searches are saved automatically, so you don't have to retype the query. Unfortunately, there's no manual way to save or delete searches. That could prove to be inconvenient or embarrassing, depending on what you were searching for! 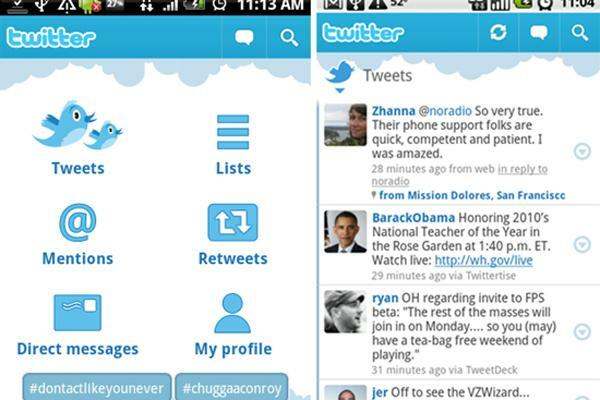 Overall, Twitter for Android performs well and is easy to use. It can log into only one Twitter account at a time, though, so if you need to manage multiple Twitter accounts you might want to check out a more sophisticated app like TweetDeck or HootSuite. If you know of a better Twitter client app, contact Brent W. Hopkins on Facebook or on Twitter as @brentwhopkins.